Humans have evolved over time. So have goalie masks. Take a walk through the goalie mask museum and watch it transform into today’s fully-shielded works of art. Queen’s University goaltender Elizabeth Graham wore a fencing mask to protect her teeth. Montreal Maroons goaltender Clint Benedict is said to have worn a goalie mask after taking a shot in the face. He came back with a leather mask that covered half of his face for just a few games before he tossed it. Japan’s Teiji Honma was the first to wear a goalie mask in the Olympics, made of leather with a wired cage in the Garmisch-Partenkirchen 1936 Winter Olympics to protect his glasses. 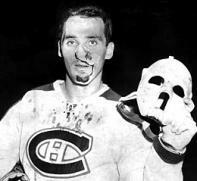 Montreal Canadiens goaltender Jacques Plante was hit in the face with a shot by Andy Bathgate. After getting stitched up, he returned to the ice with the goalie mask he’d been using in practice. Canadiens coach Toe Blake wouldn’t let Plante wear the mask during games up until that point, but his goaltender said he wouldn’t go back on the ice without it. Blake obliged as NHL teams didn’t have back-up goalies at the time. This was a fiberglass mask that covered his entire face. He ultimately won the game, but was largely considered a coward by hockey purists at the time. The mask now rests at the Hockey Hall of Fame in Toronto. 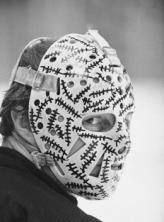 Gerry Cheevers had his trainer paint stitches on his fiberglass mask whenever a puck or stick struck him in the face. 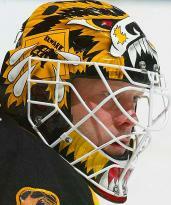 It is still perhaps the most recognizable goalie mask in hockey history. He is considered the pioneer of goalie mask art and design. 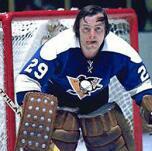 Dave Dryden, brother of Ken, was the first to create and wear the modernday fiberglass mask with a cage. He cut out a space in the fiberglass mask and filled it with a cage to help better protect his face. In the 1972 Summit Series, Russian goaltender Vladislav Tretiak used a helmet-cage hybrid mask. It featured a regular hockey helmet with a full bird cage covering the face, which soon after became quite popular. Even after they went out of style, Dominik Hasek continued to wear this type of mask until his retirement in 2008 and Chris Osgood still wears one with the Detroit Red Wings. It is considered lighter along with providing better vision. Andy Brown was the last North American professional hockey player to play without a mask. Eye injuries to Gerry Dejardins and Bernie Parent accelerated the transition for goalies to use more protective masks. The birdcage masks, a la Hasek and Osgood, are almost fully replaced by the hybrid fiberglass cage masks. 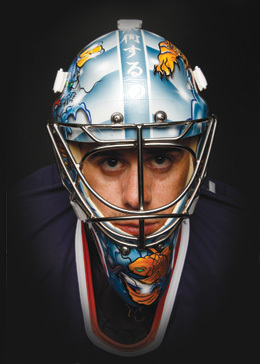 Goalie masks have become an art form, an expression and an extension of a goalie’s uniform. Companies and manufacturers are still continually trying to modify designs to better serve goalies, both in safety, performance and comfort.